Union Pacific’s rail safety programmes helped improve public safety and contributed to a 5% decline in vehicle–train collisions at railroad crossings in the first half of 2017, compared to last year. Union Pacific reported a 2.27 crossing accident rate across its 23-state network, calculated by the number of Federal Railroad Administration reportable grade crossing accidents per million train miles, compared to a 2.40 rate during the first half of 2016. Cities and counties determine where roads intersect with rail lines and warning signs at public railroad crossings. Union Pacific’s Crossing Assessment Process (CAP) studies the crossing characteristics and focuses its efforts where incidents may be more likely to occur. While all crossings complying with Union Pacific maintenance standards are safe for drivers, the programme identifies safety enhancements that may require working with cities to add signage such as pavement markings. For private crossings, the company works with landowners to find alternative access that doesn’t cross the railroad. The U.S. Department of Transportation studied train-vehicle accident reports over a 10-year period and found 94% of public railroad crossing accidents were caused by risky driver behaviour, such as driving around activated automatic gates. 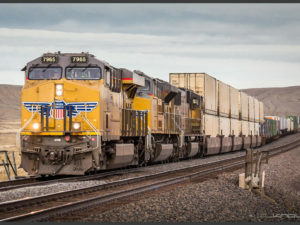 Union Pacific’s Crossing Accident Reduction and Education Safety (UP CARES) public safety programme allows the company to work with communities through a variety of outreach channels. Thousands of UP CARES events are held annually across Union Pacific’s 23-state network to educate pedestrians, motorists and truck drivers about how to stay safe around railroads and grade crossings. Union Pacific outreach efforts also include annual digital and social media rail safety video campaigns urging pedestrians and drivers to use caution near railroad crossings. The campaigns include engaging videos shared through Facebook and YouTube and encourage audiences to share videos, images and rail safety ideas.